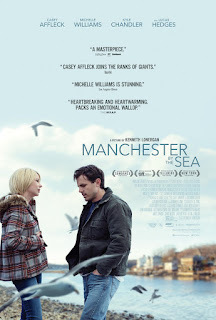 "Manchester by the Sea" begins in the past, as Casey Affleck playfully kids around with his young nephew on board a fishing boat with his brother. The scene changes to current time. Now, Affleck works as a janitor/handyman in a set of blue-collar Boston buildings. The man on the boat possessed joy: The man working as a janitor seems empty inside, with his emotions closed down. A telephone call changes everything. His brother, played by Kyle Chandler, has suddenly died. Affleck must return to his home town of Manchester by the Sea to arrange the funeral and oversee care of his now-teenage nephew, played by Lucas Hedges. The setup makes you expect the usual coming-of-age story or emotional breakthrough, accomplished by the reunion of the older man and teen. Instead, "Manchester by the Sea" turns more and more surprising. The film slowly reveals the source of Affleck's pain; and in doing so, hits a deep nerve of loss and longing. Film scholars and movie lovers won't soon forget a chance encounter between Affleck and his ex-wife played by Michelle Williams. The slow, sure buildup to this scene qualifies "Manchester by the Sea" as an award contender and most definitely one of the year's best. Kenneth Lonergan writes and directs, and demonstrates just how powerfully film can show the truth of our lives. "Manchester by the Sea" captures the feel of the small fishing town. It showcases a wonderful cast, who produce some of the best performances of their careers. This combination is extraordinary. 4 Stars, highest rating. Does it deliver what it promises? Profound drama, that sneaks up on you. Is it entertaining? Important and powerful. Is it worth the price of admission? A must-see.